Treat Yo’Self Fries – Hand-cut French fries, topped with fresh-sliced, melted cheddar cheese, jalapeños, homemade bacon bits, served with a side of their house-made peppercorn ranch dressing. A great snack to enjoy while sitting at the bar watching one of the multiple TVs with your favorite game on. Fried Green Beans N’ Carrots – I usually love anything that’s fried, but I wasn’t sure how I felt about fried vegetables. These fresh green beans and carrots are handbattered and flash-fried then served with a side of their house-made chipotle ranch dressing, and I totally could’ve had this for my meal. Now I need to find somewhere that has fried broccoli. 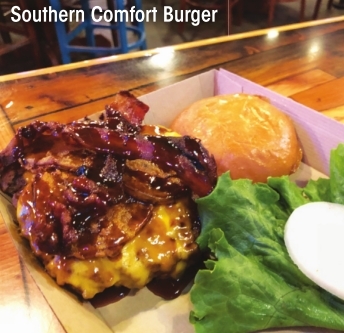 Southern Comfort Burger – This burger option started out as a monthly special but was so popular they permanently added it on the menu. The Wagyu beef patty is topped with fried green tomatoes, thick slices of bacon, melted cheddar and a house BBQ glaze. The star of this burger: the fried green tomatoes. Wagyu beef isn’t your thing? Don’t worry, you have options! In addition to Wagyu and buffalo, there’s always a third patty option each day, like alligator, lamb, camel and beaver. Check the menu before ordering to see what is available that day. Chopped Mexican Salad with Veggie Patty – This chopped veggie patty is served on a bed of roasted corn, black beans, jalapeño relish, half an avocado, tomato and chopped romaine lettuce served with a side of their house cumin lime vinaigrette and queso fresco. Their veggie patties are made fresh each day from black beans, chickpeas, quinoa and brown rice. It is 100 percent vegan. In all the times I’d been to Twisted Root before, I never could make myself order a salad. After trying this one, I can’t believe I waited so long. It was delicious and filling. 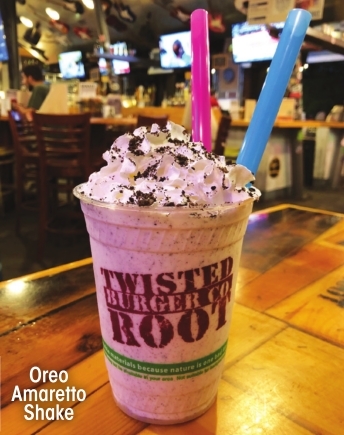 Oreo Amaretto Shake – This is their most popular adult (spiked!) shake. All of their shakes start with vanilla custard made in a real custard machine. They then mix in Oreo crumbles and a shot of Amaretto. Delectable. Enough Said Burger – Patty topped with cheddar cheese, peppercorn ranch and potato chips. How can you go wrong with a burger topped with potato chips? This is the first Twisted Root not located in Dallas, and it’s safe to say that Shreveport loves it. So much so, local proprietor Grant Nuckolls opened a second Twisted Root location inside an old gas station on Airline Drive in Bossier. Fun and funky don’t begin to describe this place, but it’s perfect for a quick lunch, family dinner on the patio, or to watch your next favorite sporting event. Friday & Saturday 11 a.m. – 11p.m.